Innis Barra is a detached cottage situated at the northern end of Gorumna Island near Lettermullen in County Galway. The property can sleep eight people in four bedrooms. There are two double bedrooms, one twin and one adult bunks room with two of the bedrooms being located on the ground floor along with the family bathroom. In addition there is a useful cloakroom on the first floor. The well-equipped kitchen features a small dining table and the sitting room includes a larger dining table to accommodate all guests as well as a multi-fuel stove. Outside there is off road parking for three cars and lawned gardens to the front, side and rear. Innis Barra is the perfect house for those wanting to get away from the hustle and bustle of daily life. Lettermullen is a small island off the west coast of Ireland, in County Galway. Lettermullen is linked to the mainland via bridges and causeways and is part of the Gaeltacht regions of Ireland, where the Irish language is most commonly spoken. Oil central heating with multi-fuel stove. 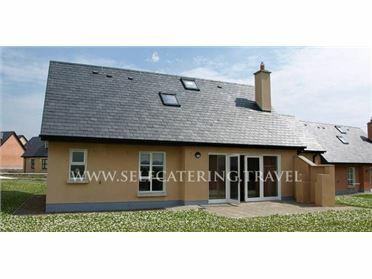 Electric oven and hob, microwave, fridge/freezer, washing machine, tumble dryer, dishwasher, TV with Saorview, selection of books and games. Fuel, power and starter pack for stove inc. in rent. Bed linen and towels inc. in rent. Cot and highchair. Off road parking for 3 cars. Lawned gardens to front, side and rear. Sorry, no pets and no smoking. Shop and pub 2 miles..